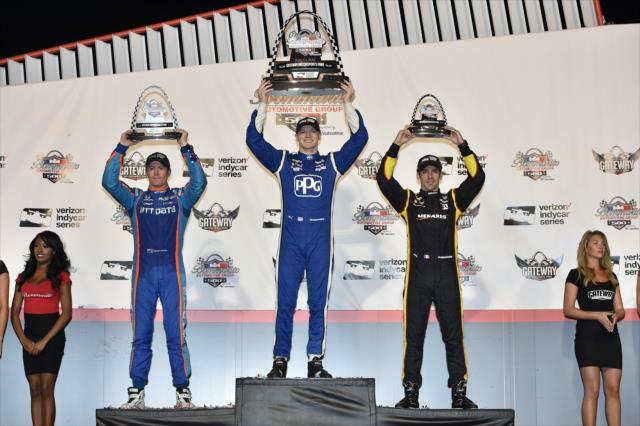 Saturday night became a night of sour bitters as the Indy Car teams returned to Gateway Motorsports Park at Madison, Illinois. But it was Josef Newgarden making a bold move on his teammate Simon Pagenaud that earned him a victory. Scott Dixon took 2nd after Pagenaud lost his momentum on lap 218. The night had a rough beginning starting with Ganassi driver Tony Kannan spinning on the last warm-up lap. Once the field passed him, the race began on yellow. It took 6 laps before the race went green and right away, Newgarden took over the point on turn 1. But on the next turn, Will Power lost his rear sending him into the wall. Ed Carpenter and Takuma Sato also collided causing Carpenter to go over Power's car nearly clearing his cockpit. Sato's car had extensive damage and was not able to continue. On lap 156, Helio Castroneves went into the pits and as he was getting his service done, right before he stalled leaving Newgarden re-taking the lead. But on lap 203, Ryan Hunter-Reay slapped the turn 2 wall causing a caution thus ending his lead. Hunter-Reay was unable to continue due to rear damage. During pit sequence, Pagenaud managed to slip ahead of Newgarden. The race resumed on lap 212. But lap 218 became the turning point of the race where Newgarden rubbed his teammate enabling him to re-take the lead sending Pagenaud wide where Dixon then took 2nd. An unhappy Pagenaud salvages 3rd followed by Castroneves who fended off a late charge from Conor Daly and Alexander Rossi for 4th. Daly's 5th place is this year's best finish for the AJ Foyt team. Alexander Rossi holds for 6th. Charlie Kimball scores a 7th followed by James Hinchcliffe, Carlos Munoz and a Sebastien Bourdais who made his series return after his crash at Indy this past May rounded up the top 10. There were tensions in the Ganassi pit where Kannan and Max Chilton in regards about their brush on the wall, thus were sacked from the race. With the win, Newgarden increased his lead over Dixon (547-516). Castroneves, Pagenaud, Power, and Graham Rahal remain unchanged. Power and Rahal lose ground on points however. But Alexander Rossi moves 1 spot ahead of his teammate Sato for 7th. Kannan and Hicnchliffe round up the top 10 as they will head us to Watkins Glen this coming weekend.